Another movie from Mrs.5000's culling of the December “Best of 2011” articles. 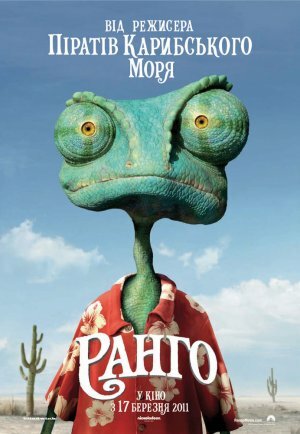 Rango is a very droll cartoon-for-adults about the absurdist adventures of a lonely lizard who becomes the hero of a small western town. But really, Rango is a very droll cartoon-for-adults about how much fun movies are. Virtually every scene – every shot, really – makes visual or verbal quotation from one or more landmark movies. Chinatown, Star Wars, the Matrix, and the classic Westerns (all of them) are singled out for extended treatment, but a drinking game based on recognizing film references in Rango could be lethal. It is a loving catalog of references calculated to delight the film geek, and I can only assume that for every joke I caught, I missed a dozen more. It’s a bit of a slow starter, it must be said, and things remain aggressively surreal for the first 15 minutes or so. Once the hero-lizard finally arrives in the town of Dirt, which is suffering from a mysterious drought – and “somebody’s dumping water out in the desert” – the comic momentum picks up, and stays pretty brisk through the rest of the movie. There were as many laugh-out-loud moments in Rango as in anything else I’ve watched for a long time. Footnote: Ebert's review is mostly about how excited he is that Rango is in 2-D, as opposed to all the 3-D movies you see nowadays. Are they making lots of 3-D movies nowadays? That's hilarious. Books about U.S. cultural history always have those pictures of people watching 3-D movies in the late 1950s with the subtext that folks back then were plumb silly, what with their naive conception of futuristic technologies. Now, the textbooks will have to have two pictures of people watching 3-D movies, and add a subtext of folks in the 2010s had learned nothing from the experience of their grandparents, and once again thought that 3-D cinema was an interesting futuristic technology. Then eventually, it will all blur together: in the century between 1950 and 2050, there was a great fad in the countries of the Northern Hemisphere for 3-D cinema; this was only fully abandoned when the "Dogme" principles became recognized as international law in 2056. Hmmm…maybe I should have watched this with my son instead of ignoring it. I took a kid to see this. He thought it was kind of slow and so did I but then I don't see too many movies (if I did I'd probably call them "films") so I probably missed 88% of the jokes.